Vakya Siddhantham and Drik � Ganitham (or Drik- Suddham) are the two major principles followed to generate Panchangams (Almanacs). Practically these are two distinctly different means adopted to achieve the same end results of determining Thithi, Nakshatram, Yogam, Karanam etc besides the occurrence of eclipses etc. Based on such details, the calendar of events towards the observance of Vrathams, Festivals, Upakarma, Pradhosham, Tharpanam etc is charted out. The Dharma Sastra stipulates the norms towards the fixation of day and time elements for the observance of the afore-stated events. Further, glossaries like �Vaidyanatha Deekshitham�, �Nirnaya Sindhu�, �Dharma Sindhu� etc act as supplement to the strictures provided in Dharma Sastra. All these aspects bring forth, the essentiality of co-ordination, discussion and mutual interaction between the personnel who generate Panchangams of various hues on one side and the erudite scholars of Dharma Sastra on the other side. 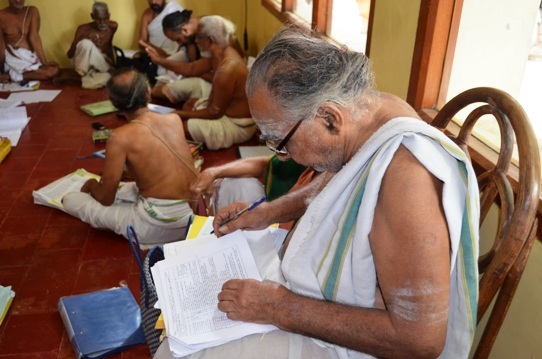 With this objective in mind, Sri Kanchi Kamakoti Peetam organizes �Panchanga Sadas�, an annual conference, convened during Chaturmasya wherein, Panchangam details are finalized well ahead for the on-coming calendar year. During the current Chaturmasya, the sadas was held on 4th Aug. 2014 at Shrimatam, Kanchipuram with the divine blessings of Their Holiness Sri Sri Sri Sankaracharya Swamigals of Kanchi Kamakoti Peetam to discuss and finalize details for the ensuing year.